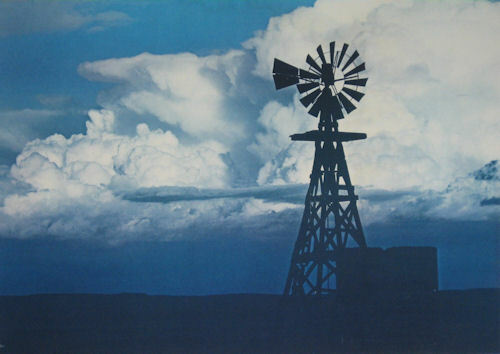 I loved this picture of the old windmill on the wooden tower with the sunlit thunderclouds as soon as I saw it. It was in a magazine ad for whiskey. I looked at the small print at the bottom of the ad. Sure enough, there was information about how to purchase a copy of the picture. I ordered three copies. I had mine matted, gave a copy to my brother and took one to my father at my next visit. He liked the picture too but when I asked him what brand of windmill that was in the picture he said "Oh it's a damned old Monitor". The title of the picture was "Harness the Wind". I later took my copy and placed a strip of paper to cover over the cliché title and wrote instead over it "Damned old Monitor". This picture hung over my desk in my office at Auburn University for many years until my retirement. In all those years with all the people who came in and out of the office, no one ever asked me about the picture or even commented about it. It was a nice wall decoration but no one would suspect that I placed it there to remind me of where I came from. From my early teen age years until my second year in college I spent nine months in school and three months windmilling with my father. I came from that contrast of school work and very hard work. And all the time I spent preparing my classes, helping my students and doing research, I could look up at that picture and think to myself how nice it is to be doing this and not doing that. As I said, no one ever asked me about the picture but I was ready with an answer if anyone were to look at the picture and ask, perhaps obligingly, if I "like windmills". My answer would not be the expected one. I would say "No"! I especially hated those wooden towers. They were dangerous. The ladder steps were always rotten and the platform would always be falling apart. And another thing, wasps would seldom build a nest on a steel tower but they loved those old wooden towers. Can you imagine climbing up there and disturbing a wasp nest? When they come after you, there is no place to go. Besides, that mill is bound to break down; it's a damned old Monitor.